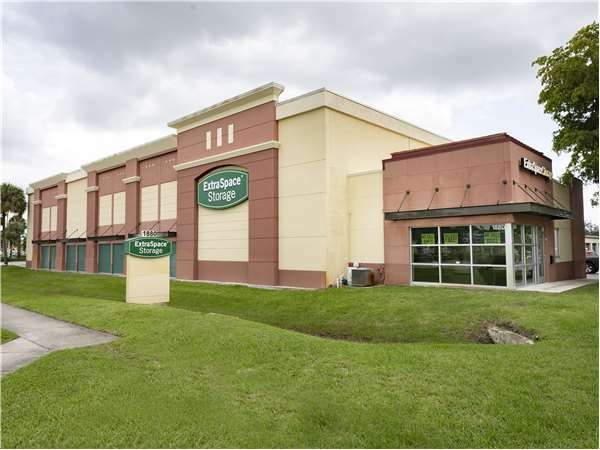 Located near the intersection of N State Road 7 and W Copans Rd, Extra Space Storage serves residents of Margate, Coconut Creek, and North Lauderdale. Locals will recognize our facility a few minutes south of Towne Shoppes of Margate. Extra Space Storage on N State Road 7 offers a large selection of storage units, climate-controlled storage, and vehicle storage. We're your go-to storage solution in Margate! With unit sizes from 4x5 to 20x20 and convenient unit features like indoor access, drive-up access, and more, our Margate storage facility has the storage space you're looking for! To ensure the safety of our customers and their valuable items, our N State Road 7 storage facility utilizes security measures like an on-site manager, electronic gate access, and 24-hour video surveillance. Concerned about storing delicate belongings? With climate control, your storage unit maintains a consistent environment between 55 and 80 degrees to protect your items from Margate's extreme heat and humidity. Climate-controlled units come in sizes 4x5 to 10x20. With 8x20 to 10x20 outdoor parking spaces and 10x10 to 20x20 enclosed drive-up units, Extra Space Storage has the secure vehicle storage options you need for cars, motorcycles, boats, and RVs in Margate! Need a place to store large commercial inventory, equipment, or materials in Margate? Our N State Road 7 location has oversized warehouse space available that can handle your business storage needs! Why do so many people choose Extra Space Storage? We go the extra mile to ensure our customers get a dependable self storage solution and excellent customer service. We maintain a secure, clean facility at all times, and our friendly, professional staff is more than happy to help with whatever you need. Contact us today to reserve a storage unit in Margate! I found Extra Space online. I read the reviews and found most were very positive. I selected the space I wanted online and received a call in minutes. I drove over and was very impressed with how clean and secure the property is. Not to mention how nice and professional the General Manager was. Very happy to have found them, I would reccommend them to anyone needing a claen and safe palce. Service is great. Very customer friendly. Today Tylla at the Margate office helped me through what could've been a stressful situation. She was very patient and sweet all 3 times I had to call her back because I didn't have the information she needed to help me. What a nice lady. I would recommend your facility over and over again. Your rates are ridiculously high. Why aren't your rates the same enterprise wide? Can't wait to move out. Michael Rosario is a pleasant local store manager and possesses wonderful and professional customer service. This is NOT common in many of our businesses in America anymore. Thank You! So happy with my choice. Anthony certainty have an excellent customer service. Thank you! I highly recommend Extra Space storage. After a family tragedy I needed to store items immediately. The young man in the office was so compassionate and helped patiently as I chose a unit to store my mom's life belongings. He stayed after hours to help me completely my rental contract. Thank you Extra Storage. Clean area and great customer service and friendly staff. Always haaa a solution to solve and storage problems. The facility were clean, staff was polite, they were quick to get me the unit size I needed & did I mention priced right. I am thrilled at this place. Its very nice and warm. The customer service is great. I've been a customer for about 8 months and have had a very good experience with customer service. The facility is very clean (even the bathroom) and is in a good and safe neighborhood. I love my space and this price is right for my budget, there was others in the area for the same size as my space but for a higher price. The staff took the time to show me around and how to lock my space up. Great staff. Vicki and Jackie are fabulous! They have been extremely helpful when moving in and they are always around so I feel extremely safe being there on my own. They know the area well so if I need something close by they always know where to refer me. 'They have made everything extremely easy. The facility is always neat and tiddy and very convenient hours. Overall, the Extra Space in Margate is a great storage facility if your looking around. The facility has courteous ,friendly atmosphere,the bus stop is right in front of it.It has security cameras in a non-ghetto area and patroling members of staff. The other place was in a spooky,high crime area that was close to home at that time that I had decided which storage place to put some immediate things in. I may need a larger space later. The facility is clean, the staff members are amazing and I am secure knowing my belongings are at this location. I feel safe when I am on site alone at night. I am very happy with my storage situation! I have been so pleased with this facility. I recently moved from my home and had to find a storage facility for my furnishings that would meet my criteria for cleanliness, safety, convenience and affordability. As soon as I walked into the office and met Vicky, the manager, and had a tour of the facility, I knew this is where I would want my belongings. Thank you. Closing my unit due to poor customer service!! Numerous incidents have occurred w/no improvements seen. I have rented from this location for many many years and have never had any type of rodent or bug problem. It is always clean and the A/C is always on. The Staff if always friendly. I highly recommend this location. the staff was friendly and helpful. knowledgeable about the rental units. able to accomodate me completely! This facilty is always very clean. I have 3 units there for a very long time. I love how clean and well kept it is. Josie is the best!!!!!!!!!! This facility has very competitive prices. Is very clean. Gated access to the drive-up units and the A/C units. Even though the gated units cannot be accessed 24 a day, the gate hours are very reasonable, and I think the fact that nobody can get in there during the night hours is just an added security aspect. If you do need 24 hour access, they have a limited number of units which can be accessed without having to go through the gate. I am very happy with the service and I would recommend this facility to anybody who is in need of "Extra Space"
On the East side of State Road 7 and between Copans Road and Coconut Creek Parkway. Next to Brunswick Bowling alley. Drive south on State Rd 7. Pass Towne Shoppes of Margate. Get in the left turn lane to turn onto NW 19th St. Our facility is immediately on your left after turning. Drive north on State Rd 7. Pass Lakewood Mall and Walmart. Turn right onto NW 19th Street. Our facility is immediately on your left. Drive west on W Atlantic Blvd. Turn right onto Banks Rd, just before you reach Lakewood Mall. Turn Left onto Coconut Creek Pkwy. As you approach BB&T Bank, turn right onto State Rd 7. Turn right onto NW 19th St. Our facility is immediately on your left. Drive east on W Atlantic Blvd. As you approach Wendy’s, Turn left onto State Rd 7. Continue straight and pass Walmart. Turn right onto NW 19th St. Our facility is immediately on your left.